The SQL order of execution defines the order in which the clauses of a query are evaluated. Some of the most common query challenges I run into could be easily avoided with a clearer understanding of the SQL order of execution, sometimes called the order of operations. Understanding query order can help you diagnose why a query won't run, and even more frequently will help you optimize your queries to run faster. 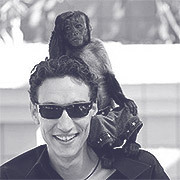 SQL's from clause selects and joins your tables and is the first executed part of a query. This means that in queries with joins, the join is the first thing to happen. It's a good practice to limit or pre-aggregate tables before potentially large joins, which can otherwise be very memory intensive. Many modern SQL planners use logic and different types of joins to help optimize for different queries, which can be helpful but shouldn't be relied on. In an instance like below, the SQL planner may know to pre-filter pings. That technically violates the "correct" order, but will return the correct result. 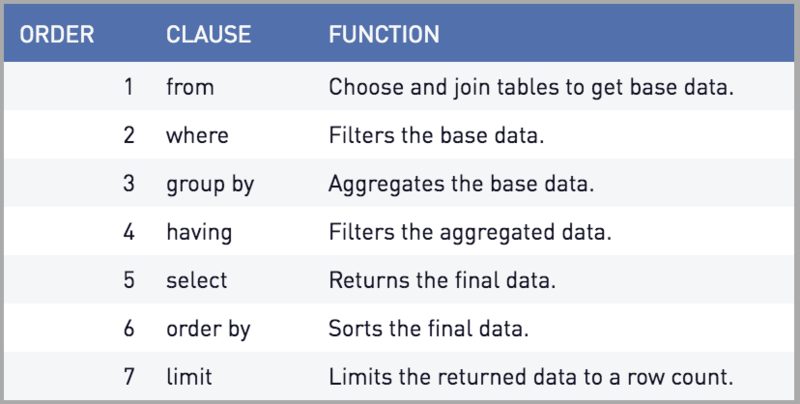 However, if you are going to use columns in a way that prevents pre-filtering, the database will have to sort and join both full tables. For example, the following query requires a column from each table and will be forced into a join before any filtering takes place. To learn more, you can also read about how we sped up our own queries by 50x using pre-aggregation. The where clause is used to limit the now-joined data by the values in your table's columns. This can be used with any data type, including numbers, strings, or dates. But it can be solved using the having clause, explained below. Group by collapses fields of the result set into their distinct values. This clause is used with aggregations such as sum() or count() to show one value per grouped field or combination of fields. Group by X means put all those with the same value for X in the same row. Group by X, Y put all those with the same values for both X and Y in the same row. The group by clause is worthy of its own post for many reasons, and you can find a lot more information about group by on our blog. The having clause is used in SQL to perform the same function as the where clause, but with aggregate values. So while the final query in the above where section will fail, this will work perfectly. If you are using any window functions, they will be calculated immediately after the having clause. Window functions may only be used in in the select and order by clauses because of their late stage in the execution plan. You may, however, use an aggregate function inside of a window function because they have already been computed. The select statement is where you finally specify the values and aggregations remaining in the data set after the grouping and pruning have occurred. The execution will be almost complete at this point, with only orders and limits left to specify. Order by is used to return the table sorted by a column or selection of columns. You can use asc and desc to define whether you want a low-to-high or high-to-low order. The following query will list countries from largest to smallest. A good understand of the order of execution will make writing efficient SQL much easier, and you will begin to see immediate improvements as you consider how your SQL optimizer is planning your queries. We have frequently seen speed-ups of 50x or more in queries with some simple changes. Every query you improve helps other queries in your database finish faster, so learning the order of execution is definitely a worthwhile investment.